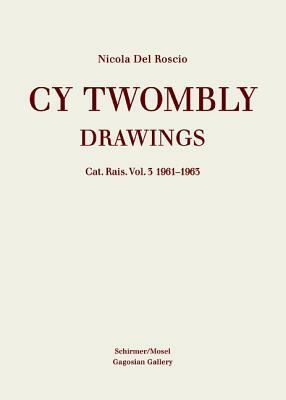 Cy Twombly, born in Lexington, Virginia, in 1928, entered the stage of contemporary art with his drawings. His nervous line making distinguished him from all his colleagues who in the 50s and 60s were involved in Abstract Expressionism. His tumbling and nervous marking opened new psychological spaces to a personal and very conceptual art. At first mistaken for something between graffiti and ecriture automatique, Cy Twombly's graphic notes eventually transformed into huge canvases of paintings in which he incorporated these notes as a maelstrom of emotional states. The Catalogue Raisonne of Drawings, edited by Nicola Del Roscio, is published in five volumes. Volume 3, covering the years 1961-1963, documents the explosion of color in the artist's works on paper. Nicola Del Roscio, born in Rome in 1944, was Twombly’s long-time assistant. The editor of the present Catalogue Raisonné, he is president of the Cy Twombly Foundation (New York/Rome) and the Fondazione Nicola Del Roscio (Gaeta).